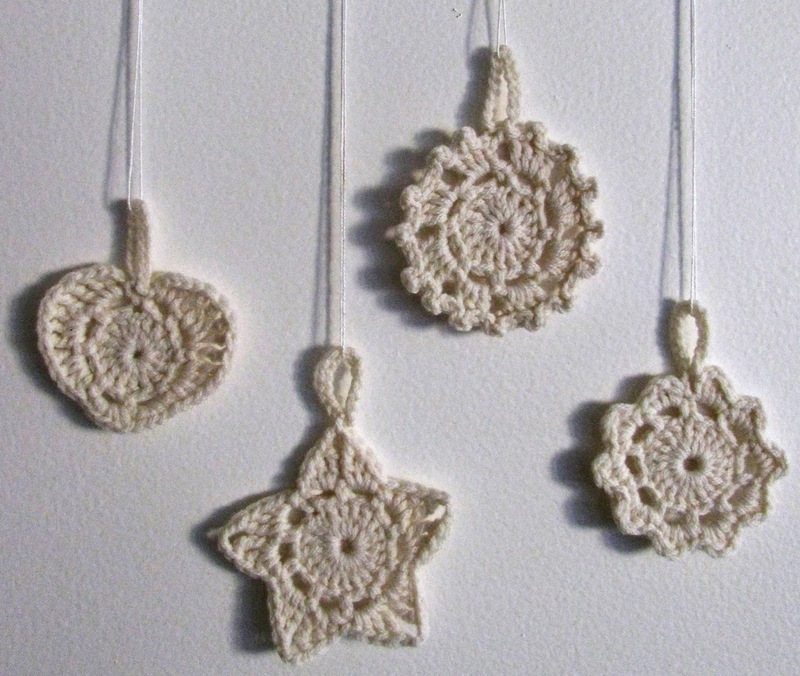 These little ornaments are quick to make and look great as present toppers or you can make a bunch of them and do a garland. I used a DK wool and a 4mm hook for these ornaments, but you can use any yarn and corresponding hook size to make them. 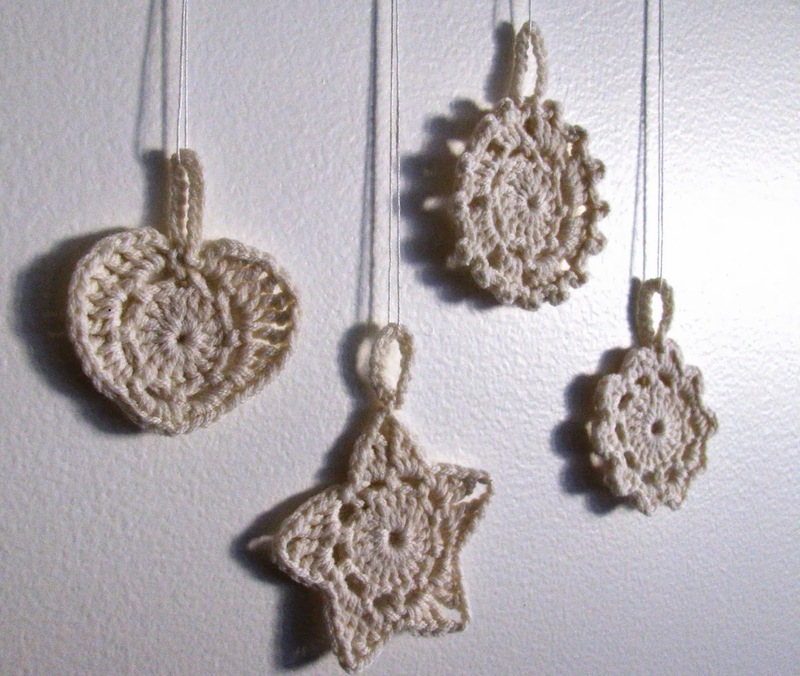 Just note the star and heart ornaments look 100% better after blocking so I suggest using a yarn that is easily blocked like wool or cotton. Sl st into next ch3 space, ch3, dc 2, trc 1, next ch3 space trc 4, next ch3 space 2dc, 2hdc, in next ch3 space sc4, hdc in next sc, 4 sc in next space, 2 hdc 2 dc in next space, 4 trc in next space, in last space 1trc 2dc, ch3 and sl st. ch16 and sl st into same space for a hanger. Sl st into next ch3 space, *sc, hdc, dc, hdc, sc* repeat ** in each ch3 space around for a total of 10 times, sl st into first sc. ch16 and sl st into same space for a hanger. Sl st into next ch3 space, *sc, hdc, dc, trc, ch 3, in next ch3 space trc, dc, hdc, sc, move to next space* repeat from * to * until 5 points have been made across 10 ch 3 spaces. For the star ornaments I fastened off the yarn here and added a ch16 loop onto the top of a point. Sl st into next ch3 space, ch3 and dc 3, *ch1, dc 4 in next space* repeat from *to* around ending with ch1 and sl st into top of initial ch3. Sl st in next 2 sts, *ch3, sl st in next st, and into ch1 space. ch3, sl st in next 2 sts. * end round with ch3, sl st in last two sp. ch 16 and sl st into same space for a hanger. What pretty ornaments! I like the variety you have.